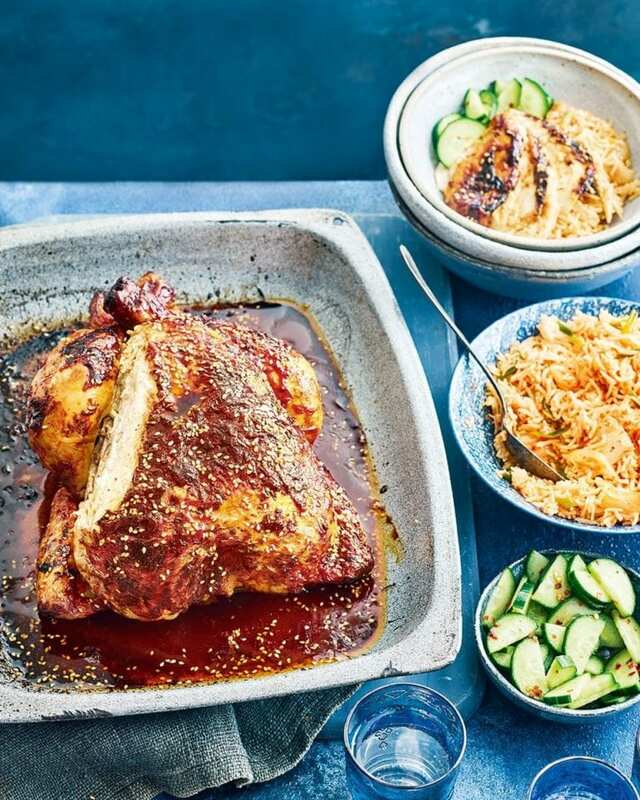 Add a Korean twist to your Sunday with our fiery roast chicken recipe. Then, later on, use the delicious leftovers in a wrap with lettuce and mayo. Heat the oven to 200°C/180°C fan/gas 6. Put the chicken in a roasting tin. Halve and juice the lime into a small bowl, then put the halves in the bird’s cavity. Mix the lime juice with the sugar, oil, garlic, ginger and gochujang until combined, then brush all over the chicken. Cover the tin with foil, then roast in the oven for 1 hour 10 minutes. 200°C fan/gas 7 and roast for 30-40 minutes more, basting now and again, until cooked through (the juices will run clear when you pierce the thickest part of the thigh with a skewer, or a digital probe thermometer pushed in will read 72°C). Ten minutes before the end of the cooking time, sprinkle over the sesame seeds. Put the chicken on a board to rest for 10 minutes. For the rice, heat a drizzle of vegetable oil in a pan. Add the kimchi and stir for 1 minute. Add the rice, kimchi juice and a splash of water, then cook for 6-8 minutes, stirring often. Remove from the heat, stir in the sesame oil and spring onions, then season to taste with salt and lime juice. While the chicken is resting, mix the cucumber in a bowl with the remaining salad ingredients and a pinch of salt, then set aside for 10 minutes to lightly pickle. Serve with the chicken and rice. Gochujang is a spicy-sweet Korean red pepper paste. Find it in large supermarkets or at souschef.co.uk. Kimchi is Korean fermented veg, usually cabbage, with garlic and chilli. Use up leftover roast chicken and salad in wholemeal wraps with lettuce, spread with mayo. Sweet and sour notes point to tangy whites such as German riesling or South African sauvignon blanc.